Houghton Mifflin Harcourt, 9780544809987, 288pp. Season after season, today’s sports superstars seem to defy the limits of physical aging that inevitably sideline their competitors. How much of the difference is genetic destiny and how much can be attributed to better training, medicine and technology? Is athletic longevity a skill that can be taught, or a mental discipline that can be mastered? Can career-ending injuries be predicted and avoided? Journalist Jeff Bercovici spent extensive time with professional and Olympic athletes, coaches and doctors to find the answers to these questions. His quest led him to training camps, tournaments, hospitals, anti-aging clinics and Silicon Valley startups, where he tried out cutting-edge treatments and technologies firsthand and investigated the realities behind health fads like alkaline diets, high-intensity interval training, and cryotherapy. 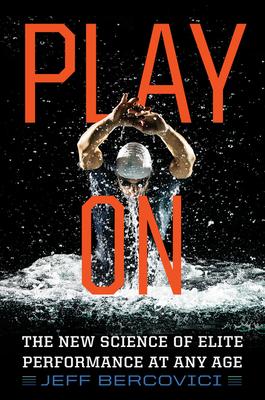 Through fascinating profiles and first-person anecdotes, Bercovici illuminates the science and strategies extending the careers of elite older athletes, uncovers the latest advances in fields from nutrition to brain science to virtual reality, and offers empowering insights about how the rest of us can find peak performance at any age.